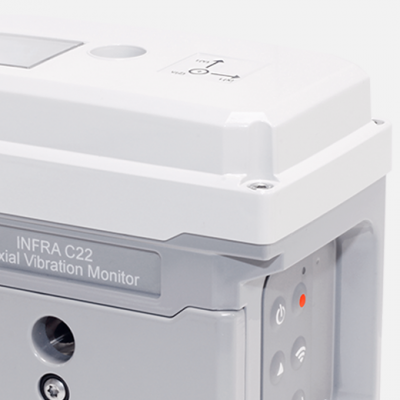 INFRA C22 – wireless triaxial vibration monitor, a wireless triaxial geophone and data logger built into the same compact unit. 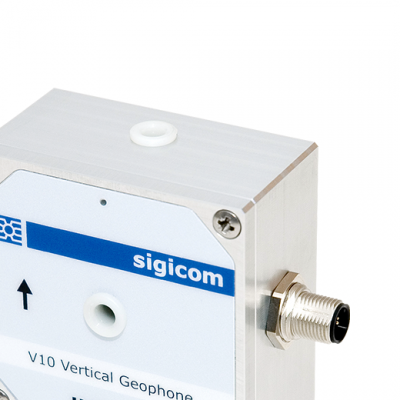 The vibration monitor has GSM/GPRS-communication, GPS position and time synchronization. 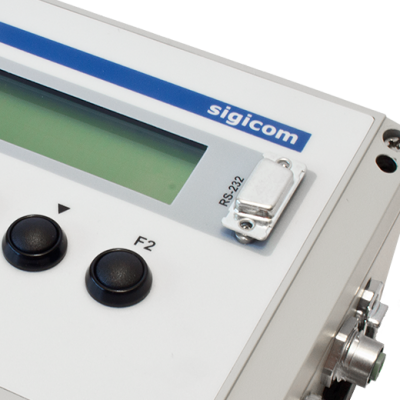 The INFRA C22 is Sigicom’s latest innovation. It is built on a brand-new hardware platform utilizing the latest technologies, such as modular communication. This will give you unparalleled reliability as well as being future proof. It works with INFRA Net (our web application) in the same way as the other INFRA sensors and data loggers. You can easily navigate using the keyboard and colour display on the instrument. The extremely low power consumption gives the INFRA C22 up to four months of measurement time, well ahead of all similar systems on the market. All filtering, signal processing and detection are done digitally. Before the recording is started you only select the wanted standard that is presented in the Remote part of INFRA Net (our web application). 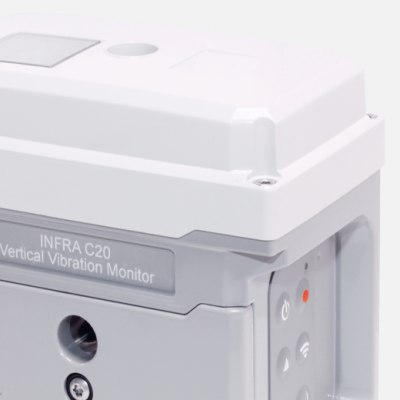 INFRA C20 – wireless vertical vibration monitor, wireless geophone and data logger built into the same compact unit. The vibration monitor has GSM/GPRS-communication, GPS position and time synchronization. 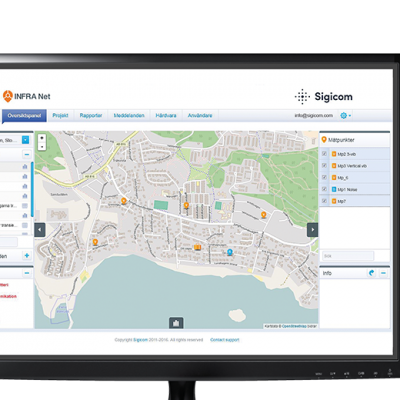 The INFRA C20 is Sigicom’s latest innovation. It is built on a brand-new hardware platform utilizing the latest technologies, such as modular communication. This will give you unparalleled reliability as well as being future proof. The extremely low power consumption gives the INFRA C20 up to seven months of measurement time, well ahead of all similar systems on the market. 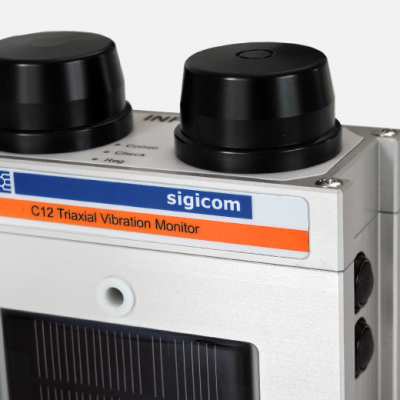 INFRA C12 – wireless triaxial vibration monitor, wireless geophone and data logger built into the same compact unit. 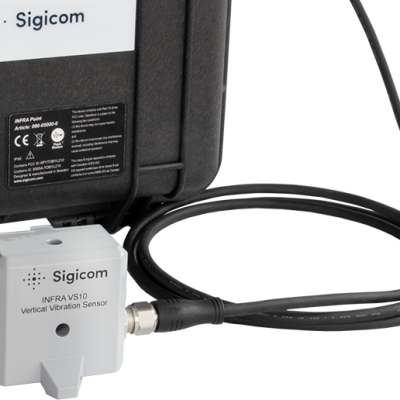 The vibration monitor has GSM/GPRS-communication. All filtering, signal processing and detection are done digitally. Before the recording is started you only select the wanted standard that is presented in the Remote part of INFRA Net. The INFRA C12 works with INFRA Net the same way as the other INFRA sensors and data loggers. 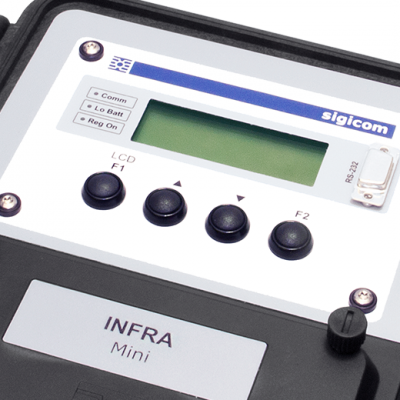 INFRA C10 – a small wireless vertical vibration monitor, wireless geophone and data logger built into the same compact unit, with GSM/GPRS-communication. All filtering and signal processing is done digitally and before the measurement is started you chose the measurement standard that you want to measure according to in the remote part of INFRA Net (web application). The INFRA C10 works with INFRA Net (web application) the same way as the other INFRA sensors and data loggers. 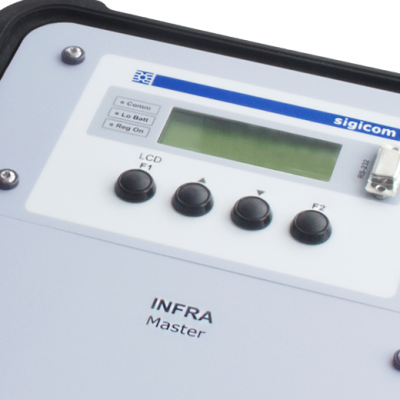 INFRA C10 acts as a combined data logger and sensor in the INFRA-system when it comes to remote changes, reporting, etc. INFRA C22 Ex a measure vibrations in explosive atmospheres (ATEX zone 1/21) such as refineries and petroleum processing plants. It is designed for INFRA C22 and has full functionality of INFRA C22 and works with INFRA Net in the same way as the other INFRA sensors and data loggers. 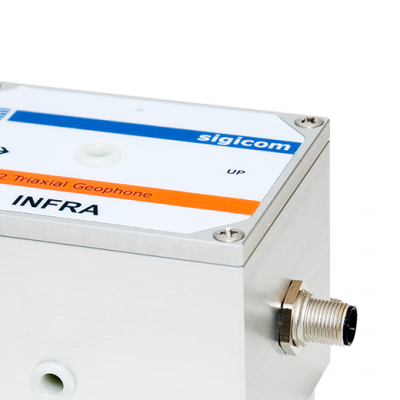 INFRA Point – a vibration monitor with a small, robust and traceable sensor (vertical or triaxial geophopne). The INFRA Point is built on a brand-new hardware platform utilizing the latest technologies, such as modular communication. This will give you unparalleled reliability as well as being future proof. 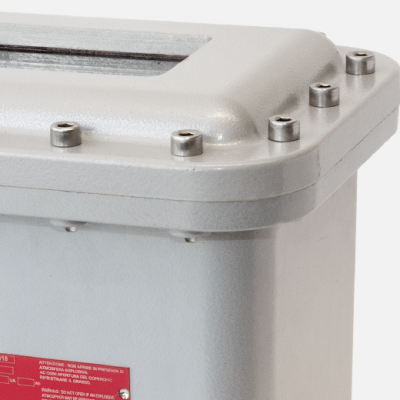 INFRA Point has up to 12 months of continuous monitoring on internal rechargeable batteries (for the vertical geophone). The monitor works with INFRA Net in the same way as the other INFRA sensors and data loggers. It can be used for measuring vibration from blasting, piling or other foundation work. Note that this product is only available in Sweden, Norway and Finland. 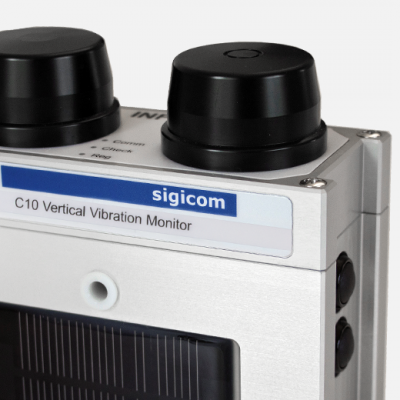 INFRA V10 vertical geophone, measures the vibrations according to many different standards. It can be used for measuring vibration from blasting, piling, traffic etc. It can also measure acceleration that can affect sensitive equipment. Adjustments between a wide range of standards can easily be set from a connected master unit. INFRA V12 triaxial geophone, measures according to many different standards. It is easy to mount on wall or floor/ground. Measures vibration from blasting, piling, compaction, traffic etc. Discomfort measurements according to most international standards e.g. Swedish standards SS460 48 61, ISO 2631-2 and German DIN 4150-3. Acceleration measurements for sensitive electronic equipment according to SS-ISO 8569.